So much for trying to paint faces. I thought I'd start by sketching but didn't get very far as I put the sketch pad down somewhere and that's the last I saw of it; I still haven't found it. Anyway I did have a good day trying to finish off a couple of projects. These are swaps I've been part of and I hadn't got around to doing anything with them. It's nice to have a way to display what you receive. This is the first, two more to go. A little houses swap organised by Greta on ArtyOz. The background paper and rub ons are Basic Grey. The door I made from card which I embossed using my trusty Cuttlebug, I then rusted it with Metal Effects; I love rust. 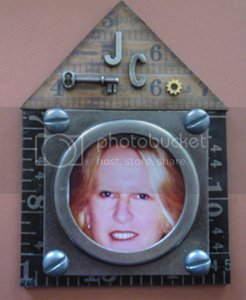 The key hole is Collections and the metal house is a buckle part I bought from Julie H in her etsy store, very cool I think. Great Job kathy! Love the buckle. I am well and truly ready for my classes! This is absolutely stunning! Love the rusty front door! Great idea! This is truly stunning and like everyone else I love the rusty door, what a great idea.